By Gordon Frickers 47 x 62 cms (18½” x 24½”), oils on board, Original sold to the government of Oman for use in a private reception room. Our painting is very much a sailor’s painting, one of a series of different types of dhows, commissioned via an agent on behalf of His Majesty Sultan Qaboos Bin Said. 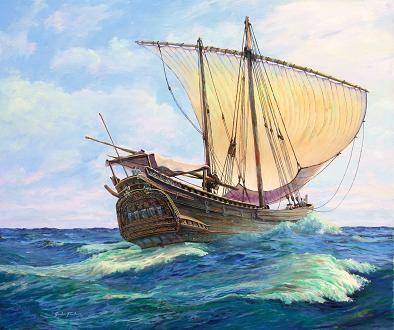 This marine painting shows a relatively large type of dhow, a Baghlah, in this instance an Arab dhow (as opposed to an African, Persian or Indian baghlah type dhow) sailing at full power in her natural environment, the open ocean, on a splendid day for sailing. 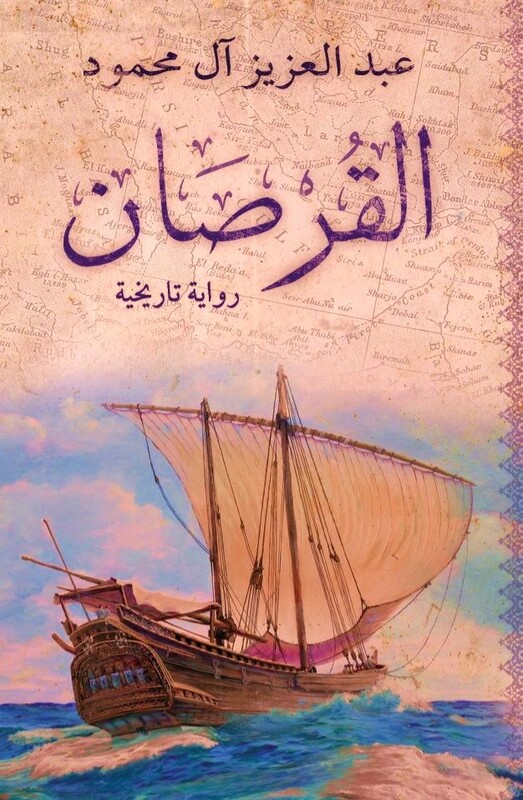 Here, our Baghlah dhow is reveling in a strong breeze and with a heavy swell, her crew have wisely dropped her mizzen sail. The Baghlah would already be up to full speed and the thrust of the mizzen in a heavy swell would only endanger her by risking a broach. 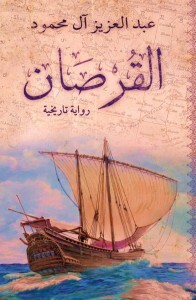 In French Boutre, in Arabic Markab, (gharab in the Persian gulf or lashab) all were lateen rigged. This fine lively painting was chosen for and licenced by me for the book cover of “The Corsair“. 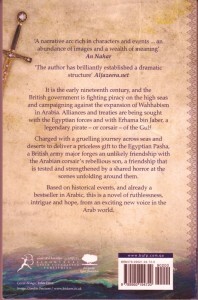 Published by Bloomsbury in Arabic and in English the book went on to become a best seller, good covers help sell books. This vessel was developed during the 13th/19th centuries, mainly as an ocean going cargo vessel often used for piracy. 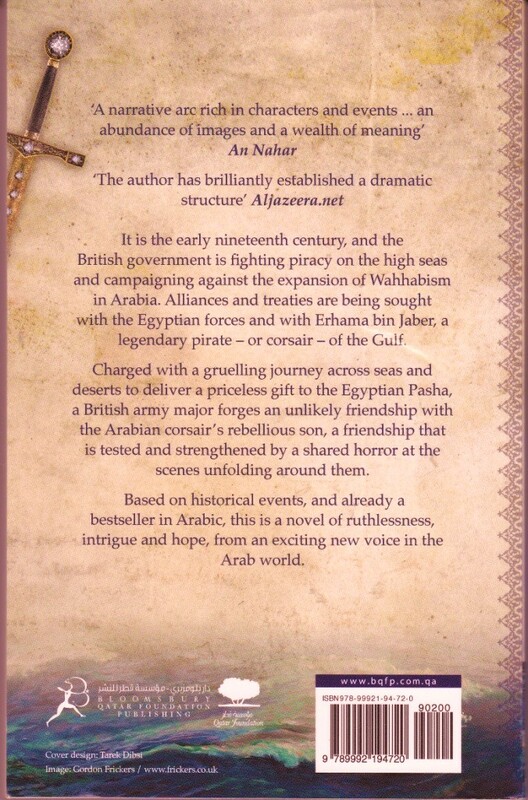 If you are thinking “Sinbad the Sailor” you are on the right track, more on that in further reading. My interest was sparked and re kindled by “There are 4 paintings that we would like to commission you to paint in total, 3 of these are for the His Majesty Sultan Qaboos Bin Said’s yacht“. Having completed that series I’ve learned a lot more about dhows and their sailor men, I’d happily paint more of the brave picturesque craft and their sea men. For certain they have many a tale to tell, ‘yarn to spin’, they deserve sensitively recording for all our posterity. Further Reading, Useful facts + excellent stories about [CF7_get_post_var key='title'].